New Customers Get 50% Off Boarding - Call Us For More Information! When you’re away on vacation, you want to know your dog is receiving the best of care and having lots of fun. 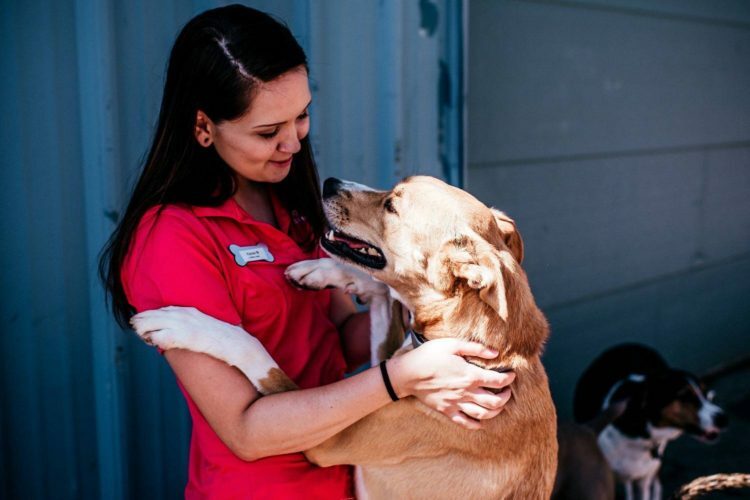 At Ankeny Bark Avenue in Ankeny, IA and Bark Avenue West in West Des Moines, IA, you’ll know that your dog is surrounded by lots of love and a trained staff that treats your dog like their own. 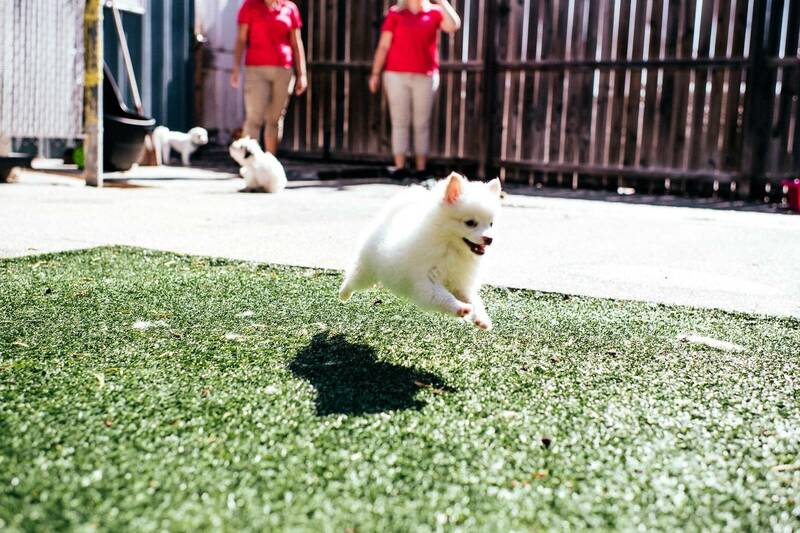 Our dog boarding guests receive top of the line treatment at our relaxing and fun pet resort! Our dog boarding accommodations are all comfortable and spacious and recommended by leading veterinarians in the area. Climate Control - Our indoor play and living areas feature year round climate control including air conditioning in the summer. Security Systems - Both locations have state of the art security to keep your pets safe 24/7. Bedding Options - We provide lamb’s wool mats and comfy blankets. Housekeeping - Our staff cleans to the highest quality standards with pet-friendly cleaning solutions. Music - Relaxing music is played throughout for a calming effect on your pet. Nutritious Food - We proudly serve Nutro Lamb & Rice Premium Pet Food. However, you’re welcome to bring your own food. If so, please bag and label each serving separately. Wellness checks - Each day our trained dog boarding staff monitors each dog with a five point wellness check to give you extra peace of mind. 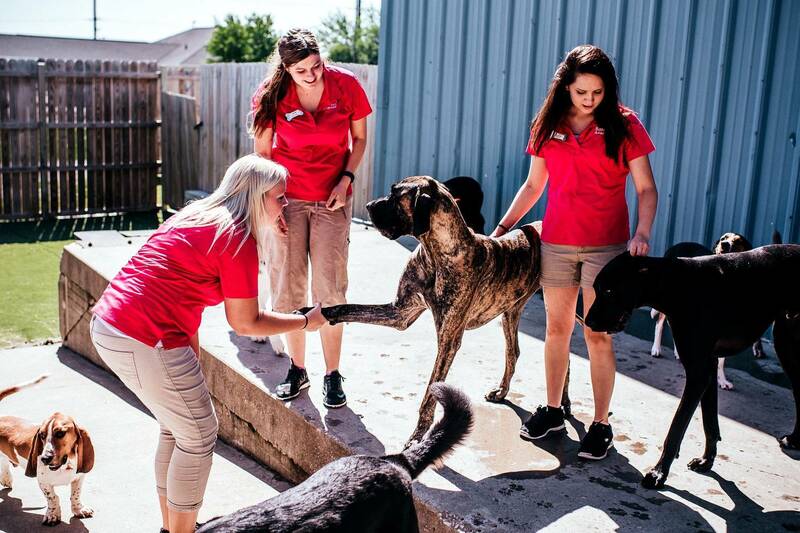 Trained Staff - Our staff participates and have been certified in Outstanding Pet Care Learning Center’s programs. This provides our staff the most up-to-date and comprehensive industry training available. Today’s family dog is a very social creature. That’s why activities and human interaction are such a critical part of a pet’s well-being. This is especially true while they’re boarding away from home. If your dog is social, we want him engaged and looking forward to playing with furry friends. If your dog prefers spending time with humans, she can enjoy her favorites like playing fetch, stimulating walks or time cuddling. 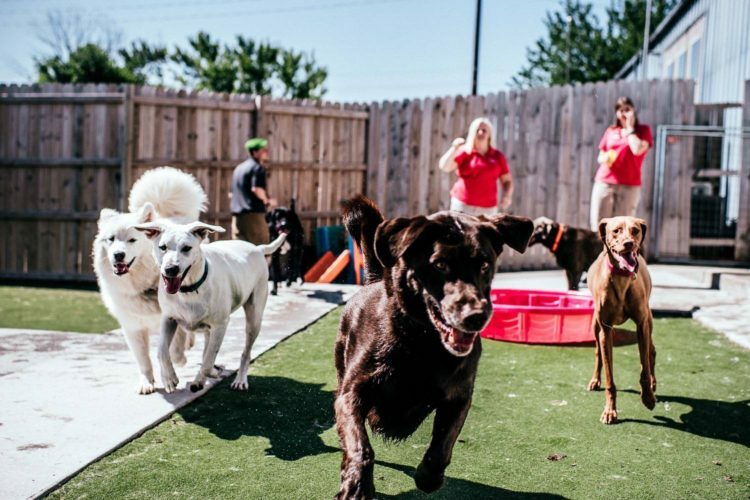 For dogs that are social and play well with other dogs, we offer safe and supervised group play. For our furry dog boarding guests that prefer to hang out and play with staff members, we offer individual activity sessions. Because activities are so important to the well-being of dogs, we have bundled some of our most popular activities into dog boarding activity packages. Our reservation specialist can recommend fun filled activity packages that your pet can enjoy during their stay with us! Group play with other dogs - Dogs have a blast romping with other dogs. Our supervised group play sessions happen in either our outdoor or indoor play yards. 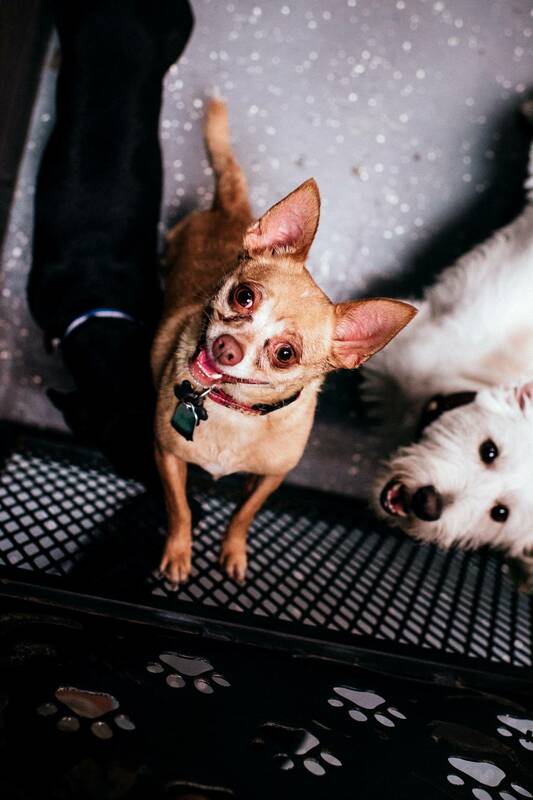 We have playground equipment designed specifically for dogs so furry guests can climb on, run through tunnels and lounge on when a break is wanted. Our large outdoor play yard is lined with K9 grass specifically designed for canine comfort and cleanliness. 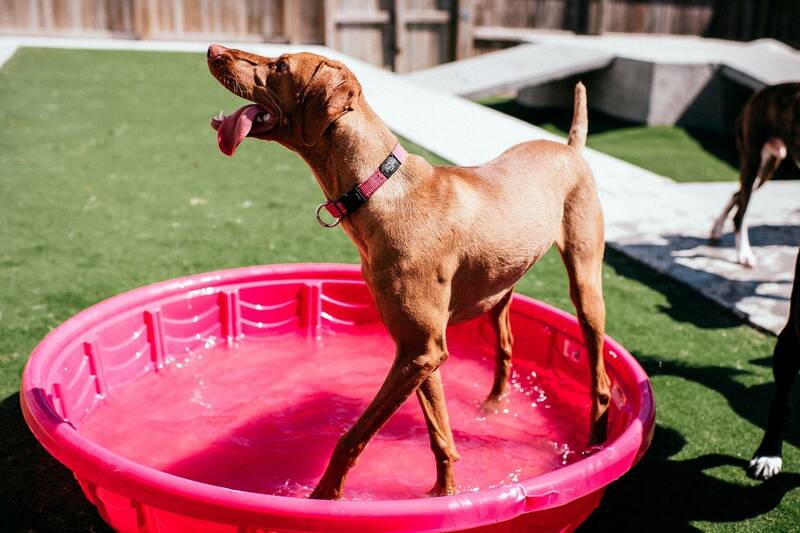 We have ten foot high secure fencing and doggie pools (when the weather is nice). Our guests love the fresh air! One-on-one playtime or pampering with a staff member - focused on what your dog loves to do. Ball time, Frisbee, splash time in our pools, cuddles. Your dog is the focus and will love this one-on-one time! Business walks - an extra trip to the outdoor elimination area for our canine friends who prefer additional potty breaks. Tuck-ins - just like at home-the ultimate pampering! One of our staff gets the fun job of cuddling your pet and preparing your pet for a quiet and peaceful night of rest. Delicious, homemade canine treats - Yummy! Our treats are mashed potato or pumpkin based, so they are super yummy and very easy on our guest’s tummies! Do we need to bring anything with our pet? We make everything as easy as possible for you. Blankets and bowls are awaiting your pet so no need to worry about bring them from home. Should we bring our own food? We proudly serve Nutro Lamb & Rice Premium Pet Food here at Bark Avenue, however, you are welcome to bring your own pet food. If you'd like to do this we just ask that you bag and label each serving separately. Should I schedule a bath for my dog? Unlike at home, where dogs have their own items and sleep on the couch, at Ankeny Bark Avenue in Ankeny, IA and Bark Avenue West in West Des Moines, IA, they share common areas with other pet guests. All areas are picked-up and disinfected daily. However, no matter how clean we maintain our facility, this interaction, especially if weather conditions are humid or rainy, may alter your pet’s natural scent. We find that dogs love the attention and pampering they receive while being groomed. Even better is all the love and extra attention they get at home when they are clean, look great, and smell good. Plus, owners appreciate less pet hair in their homes! We’re happy to quote you with a bath price upon check-in. We love Bark Avenue and everyone there! They realize that dogs are family members and not just pets, and treat them all like they are a part of THEIR family! Our dog, Sadie, loves to go and play with her friends (both human and four-legged), and have spa days with the excellent groomers there! When we go out of town, I have peace of mind because I know that Sadie is receiving the best care there is! I just can't say enough about how friendly, knowledgeable, and helpful everyone at Bark Avenue is! We truly feel "at home" there!